This couple took Need to Breathe’s “Forever on Your Side” to a whole new level. When Miguel Castillo and Andi Dunn met, they quickly discovered they had a shared love for the group Need to Breath. The music inspired their faith, and added fantastic memories to their dating life as they traveled to see them in concert near and far. Miguel realized that proposing to Andi at a Need to Breathe concert was the perfect way to start the rest of their lives together. After reaching out to Beth Bacall at WFSH/Atlanta (104.7 The Fish) she immediately put love into action. 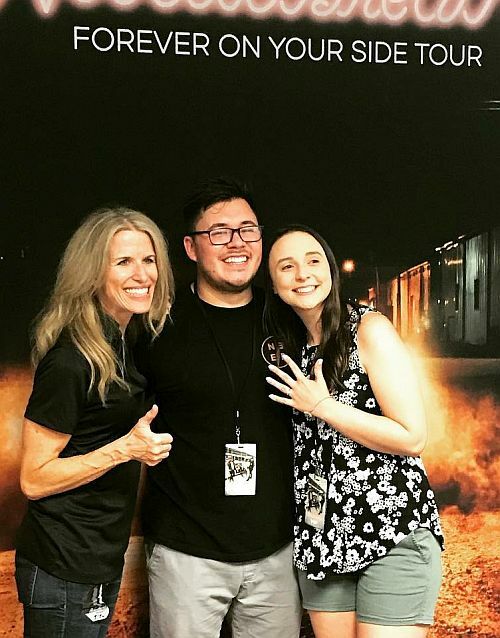 With the help of Word Entertainment and the Need to Breathe Crew, Miguel popped the question backstage with the full support of Bo, Bear, Josh and Seth. And, she said yes! Pictured are WFSH air personality Beth Bacall and the lucky couple.